Secrets, secrets are no fun! 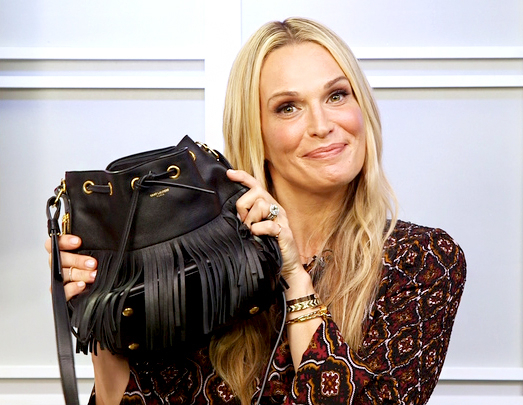 When Molly Sims recently stopped by Us Weekly’s New York City headquarters, we had to know what her go-to beauty products were. She shares the beauty products she won’t leave home without and reveals what else she keeps in her Saint Laurent fringed bucket bag – watch the video above to find out! While in New York to team up with LiveHealth Online, the model also told Us about her new book – Everyday Chic: My Secrets for Entertaining, Organizing, and Decorating at Home. “It’s all about making things that take a lot of effort, look effortless. Whether it be in the kitchen, design and décor, organization, we talk a happy, healthy home.” The mom of three knows how to get things done all while looking and feeling great, inside and out!